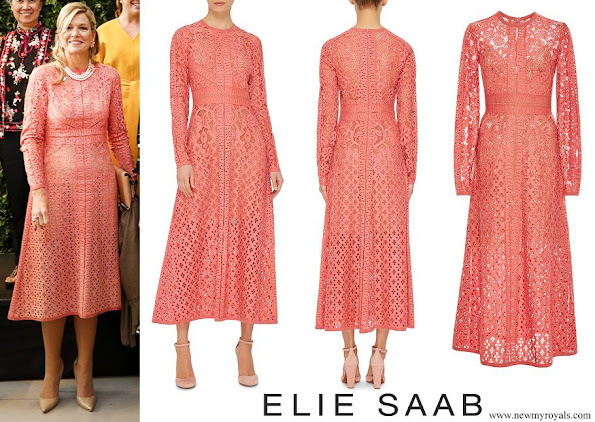 Now this Elie Saab dress Maxima is wearing is great. She looks stunning so do all the Ladies. The Argentinian First Lady, Malania and the others too Great choices made in fashion. I like the outfit and her styling. Nice dress, already worn a few times before, but that doesn't matter. The only issue I have is with the bust of the dress; I saw this also the other times when she wore it. It doesn't fit at the bust, like it's too big or something. Her hair is beautiful!, and also are her jewelry and shoes. The part I like the most of this outfit is her 'new' hair. It is really wonderful how she wears it!! 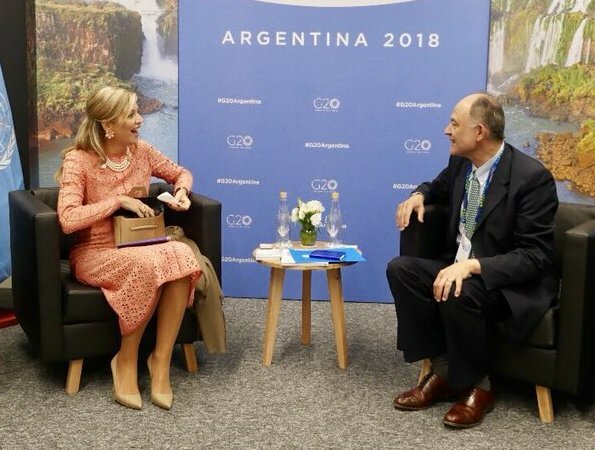 Anyone knows what Argentina's First lady is wearing? Love that dress! Maxima's dress is not made to be photograped at. I have the same dress and it adds several kilograms in pictures, especially to the stomach and around the shoulders.I bought it for a wedding, and it was a success in person and a disaster in pictures. It can only look OK if one has super slim waist. I agree the dress doesn't photograph well here. Sorry to hear that you had to learn that the hard way! Very nice! She looks wonderful in a beautiful dress. I like Maxima's dress but it makes her look boxy, her hair looks a lot better. 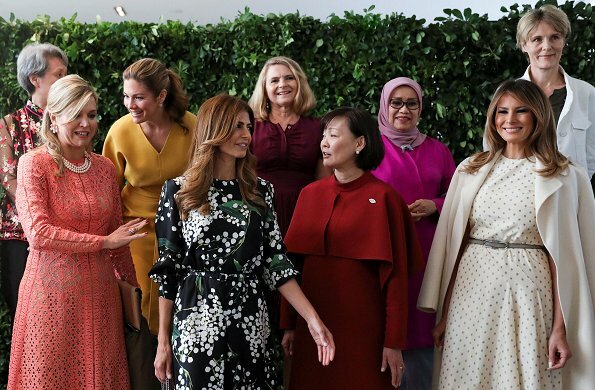 FLOTUS Melania Trump looks great, in general all the ladies look good. Crown princess Victoria has the same dress. On a aussi vu cette robe sur la princesse Victoria. Princess Victoria has the same nice dress as well. Looking at different very recent pictures of Maxima I think her face has changed. She looks quite nice but I think it is not only the result of nature. Agree with MaryT and think the same. Max looks quite nice..
Also love Maxima's new hairstyle, well it looks better than when hanging loose, and not tidy. But where's Brigitte, I miss her on the photo's, did they return home already? Maxima looks very nice - the dress is pretty. There have been some nice pieces on this visit. Why is the Netherlands a member of the G20? It is not. Maxima is an Honorary Patron of the G20’s Global Partnership for Financial Inclusion plus she's Argentinian. In my opinion, she shouldn't be in the picture with the G20 country members group. Nin Pujol: But Mark Rutte is there too? 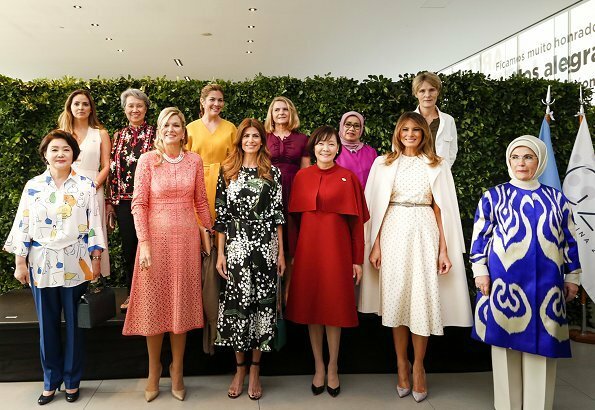 Just to note, my favourite dress is Mrs. Trump's.- Anyway, the Dutch Queen looks better because of a "lighter" Make-up perhaps? Not to forget the "well-done" hair. Maybe extensions? I guess she is in a great mood for being back home in Argentina... She looks really happy and relaxed. She's standing in the G20 picture next to the PM. If he wasn't there, than she couldn't attend the cultural event (I think). And because the museum visit is a 'side event' she can join it because this isn't with the leaders of the G20. Maxima's pale coral dress would be so beautiful if only it had a proper lining. The illusion of a see-through skirt, even with the cropped slip underneath, is not a good look for anyone, let alone a reigning queen. CP Victoria's version of this dress was a let-down for the same reason. I'm an admirer of Elie Saab so am disappointed that his design house would sabotage a potentially gorgeous garment with a see-through mesh effect. 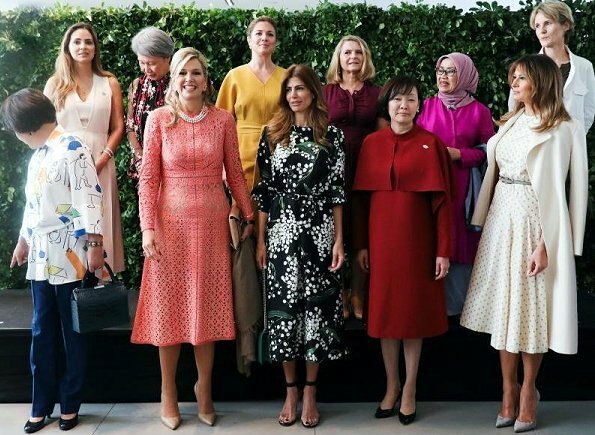 The Argentinian, Chinese, and U.S. first ladies look superb! we kunnen wel voor de dag komen, met onze MAXIMA ,altijd vrolijk!!!! I love this dress, it is such a fresh colour. I also like her hair. Which makes me want to ask a question; am I the only one to find Melania's hair a bit weird? I just want to strike it backwards... Love her dress though. All the ladies look very nice .Maxima looks fabulous and she is the star here I think.